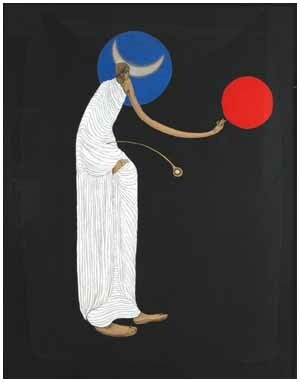 The intensity of Datta Bansode's politically aware paintings may be traced to his first encounters with art as a boy in Latur. Bansode's first teacher was the artist and Buddhist monk Jagtap Sur. Using hardboard and enamel paints, Sur painted portraits of Buddha, Gandhi, Nehru, and Shivaji in a vivid, realistic style. "He was my first guru," says Bansode, "a good teacher of drawing and painting." Bansode went on to study art in Pune and Mumbai, taking inspiration from his conversations with senior artists Prabhakar Barve and Tuka Jadhab. At the J.J. School of Art, he became exposed to the contemporary styles and began experimenting with new techniques of applying paint to canvas. He describes his works of this early period as brightly-coloured compositions depicting daily scenes, including ad hoc still-lifes of his bedroom and portraits of his friends. A turning point came in 1992, when Bansode returned to Latur in the aftermath of a major earthquake. Walking through the ravaged streets, he glimpsed many women in mourning for their lost families. The starkness of their figures touched him, and inspired a change in his style. "I painted the widows over and over, and gradually their figures became simplified." Abandoning bright colors, Bansode began to work with a palette of chalk-white, beige and charcoal, creating somber, uncluttered compositions of grieving widows. His work shifted in focus after the 1998 nuclear bomb tests in India. Bansode was struck by the irony of the code phrase - "Buddha's Smile" - used by the government to refer to the tests. "After all," he says, "Buddha's philosophy is one of peace, and anti-crime." In response, he began his Lord Buddha series. Bansode explains that "I wanted to show that Buddha's birth happened here, but we have forgotten his philosophy." Retaining a neutral palette, the series draws on the paintings of Ellora and Ajanta to depict the major events of Buddha's life. The details of Buddha's figure are inspired by the Mathuran and Gandhari sculptures of the Buddha. As influences, Bansode names the work of Tyeb Mehta and Sunil Das, stressing the importance of the Indian tradition in his own approach to art.